01-07-2019 Our store is open again. We want to thank everyone for your well wishes!! Thank you The Management. 12-07-2018: Due to a death in our family we will be closed until further notice. We look forward to be back in business again! Thank you The Management. 01-01-2017: The store will be opening again on 01-21-2017 we look forward to be back in business again!. Thank you The Management. 11-15-2011: The store has been closed for months. We are hoping that someday we will open again. If you have placed an order with us please let us assure you that your credit card has " NOT " been charged for anything. We DO NOT have away of processing them. Thank you The Management. 12-31-10: We will be closing our business. All orders placed prior to the closing date will be processed. Thank you to all of our loyal customers/friends through out the years. May God Bless and keep you! 11-27-09: We have caught up and all orders prior to today have been processed. Thank You again! 11-09-09 & 11-20-09: Our complete computer systems failed. We are working hard on getting caught up and all orders out in a timely manor. THANK YOU for your patience! 08-01-09: We are pleased to announce that we are carrying the Bespaq Products If there is a particular item of theirs you would like, Please let us know. 07-04-09: We are pleased to announce that Hudson Rivers was purchased and we will start carrying their items again! Look for Items starting with *HR* If there is a particular item of theirs you would like, Please let us know. 12-31-09 Happy New Year! Our Supplier of "GLENOWNE" Miniatures has decided to stop carrying their Items, sorry! February 7, 2007: We will no longer be accepting PayPal for payment, sorry! January 19, 2007 - Coming Soon items from Glenowne. January 12, 2007 Most Items from Chrysnbon, Chrysolite, Multi-Minis, Barbara O' Brien curtains, NWC fencing, Magic Systems, and a few others, well be available again. January 1, 2007 - HAPPY NEW YEAR!!!! From August 29 to September 15, 2006 We will be closed for inventory. All orders placed during this time will be processed after the 5th. August 27, 2006: Some Items may take longer to get, due to Handley House acquisition of Dee's Delights. Items such as Chrysnbon, Chrysolite, Multi-Minis, Barbara O' Brien curtains, NWC fencing, Magic Systems, and a few others, may take a little longer to get so, please bear with us during this transition period. August 7, 2006: Handley House, Inc. announced the acquisition of Dee's Delights by them., Dee's items are to be moved to Handley's Wheeling, West Virginia facility. As of Tuesday August 1, 2006 Most items from Mike's Miniatures will not be available until Mike returns home. Due to a Military Deployment, temporarily we will not be taking special orders on furniture products made by Mike's Minis. He is bravely serving Our Country. Thank you for your service Mike and All Brave Soldiers through out the world for keeping us safe!! As of Saturday July 8, 2006 we will no longer be carrying product # HR54172 Preserves. Decorating purposes and are not recommended for Child under 7, without Adult Supervision. 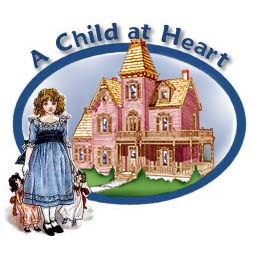 All Logos and pictures are for Exclusive use for A Child at Heart, Inc. of OK.
Site Design by Susan Kimball for A Child at Heart, Inc. of OK. Web site Designed Exclusively for A Child at Heart, Inc. of OK.
Store Logo Designed Exclusively for A Child at Heart, Inc. of OK.